Are The Tipsy Red Fox Painting Parties fun for everyone? Prices are for The Tipsy Red Fox Studio - Currently on special at $35 a person for groups of 3 or more and couples get in for $75 - usually $100. ​To qualify for a private party you need to have 6-12 attendees in your group and a min. payment of $210 to cover the cost of your 1st 6 guest to hold your date and time when you book. All session times are considered public parties until a private party has been booked. Booking requires payment at least 2 hrs prior to the event and is preferred as far in advance as possible - To ensure the likelihood of getting the date and time you want - booking in advance is a way to secure your spots. Follow the steps to get yours now by clicking the Book Online button below. Parking available just after 32nd st heading North on Broadway on the right side. You are looking for the middle red brick apartment building on the corner just before 32nd st. labeled 3205. Once you and your group arrive please ring me at (954) 982-5542 and I'll come let you and yours in! Looking forward to painting and goofing with you soon! 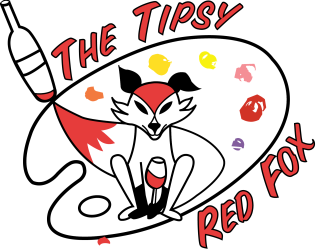 All pictures taken by staff at events hosted by The Tipsy Red Fox may be used for promotion purposes such as but not limited to: social media, printed marketing materials, crowd funding, and this website.